On June 9, 1865, while traveling by train to London with his secret mistress, 53-year-old Charles Dickens--at the height of his powers and popularity, the most famous and successful novelist in the world and perhaps in the history of the world--hurtled into a disaster that changed his life forever. Did Dickens begin living a dark double life after the accident? Were his nightly forays into the worst slums of London and his deepening obsession with corpses, crypts, murder, opium dens, the use of lime pits to dissolve bodies, and a hidden subterranean London mere research . . . or something more terrifying?Just as he did in The Terror, Dan Simmons draws impeccably from history to create a gloriously engaging and terrifying narrative. Based on the historical details of Charles Dickens's life and narrated by Wilkie Collins (Dickens's friend, frequent collaborator, and Salieri-style secret rival), DROOD explores the still-unsolved mysteries of the famous author's last years and may provide the key to Dickens's final, unfinished work: The Mystery of Edwin Drood. 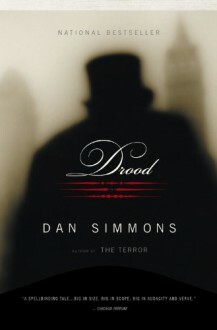 Chilling, haunting, and utterly original, DROOD is Dan Simmons at his powerful best.